Let me make something perfectly clear. 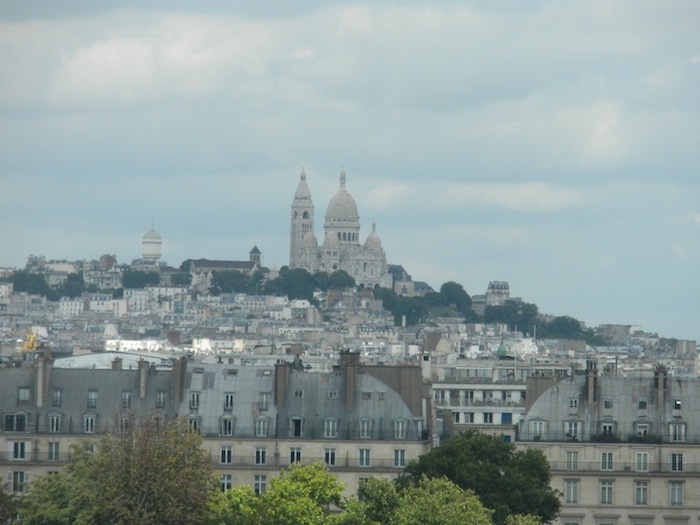 France is fantastic, but I can’t stand Paris. 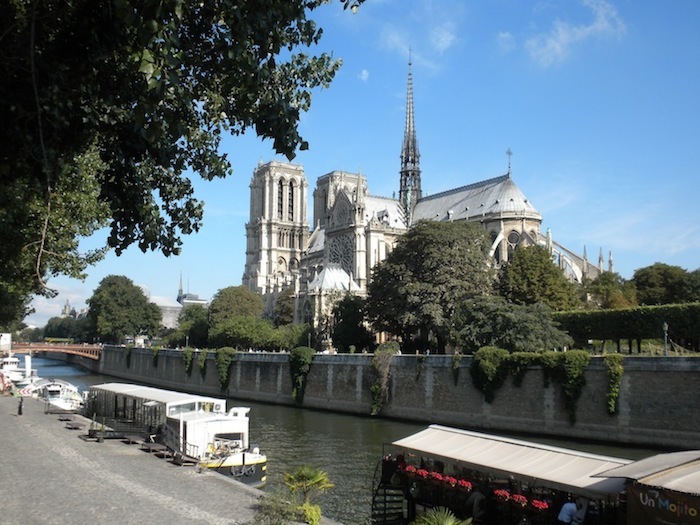 I first visited Paris as a high school freshman, and I was 14-years old. It was a high school trip, my first trip abroad without my parents. Actually, that trip went fine. I liked it so much, I returned on a high school trip for my sophomore year. That’s where the animosities with Paris begin. 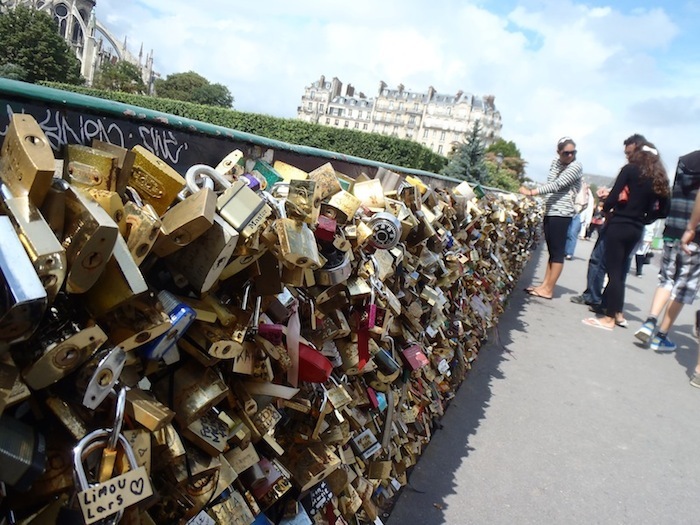 The new thing in big cities, you can buy a lock, latch it to a bridge, and leave it there. ... and all the pretty French girls were American. Nothing bad happened to me personally, but the trip was full of negative events. My chaperone (and good family friend) had his pocket picked on the metro. A trip friend had his pocket picked at Le Place de la Concorde. He actually ran down the culprit and got his stuff back. There was another student, who was swindled out of $500, while waiting in line to exchange money at a train station. 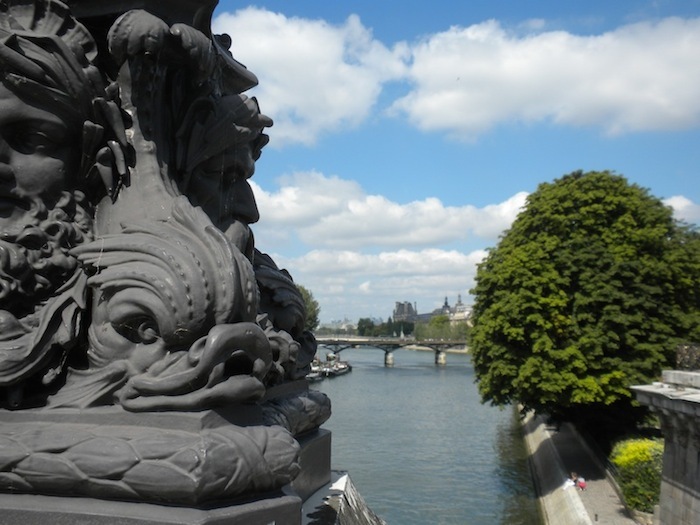 A walk along the Seine is well worth it. 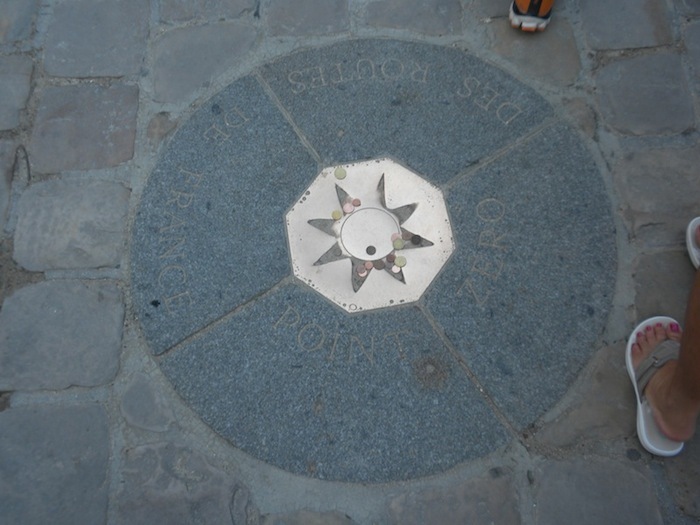 This marker is in front of Notre Dame, and it marks the center of Paris. All distance measurements are taken from this point. Pssst...He's standing on that little guy's back. We saw two traffic accidents. One happened right in front my chaperone. A car ran a red light, and hit a taxi. I heard my friend as he rushed to help, “Ça va? Ça va? ” The drivers leg was bleeding a bit. A horn from one of the wrecked cars blared on and on. Soon enough, firemen arrived, and they did everything they could to get the horn turned off. The facade catching the light. Back to more current time, my family and I made a 2-night side trip to Paris. I was reluctant to go, but it was the kids’ first chance to see it. We drove to Marseille and took a fast train to Paris. One of my current travel mates thought we were crazy to go, and I agreed with him actually. He warned me of the “Romanians.” I don’t think he really meant Romanians. Perhaps he was making a derogatory reference about Gypsies. In any case, he was referring to hooligans, French or non-French, in general who move to Paris to take advantage of full-pocketed tourists. Our hotel was on Rue St. Germaine, only a few blocks from Notre Dame. 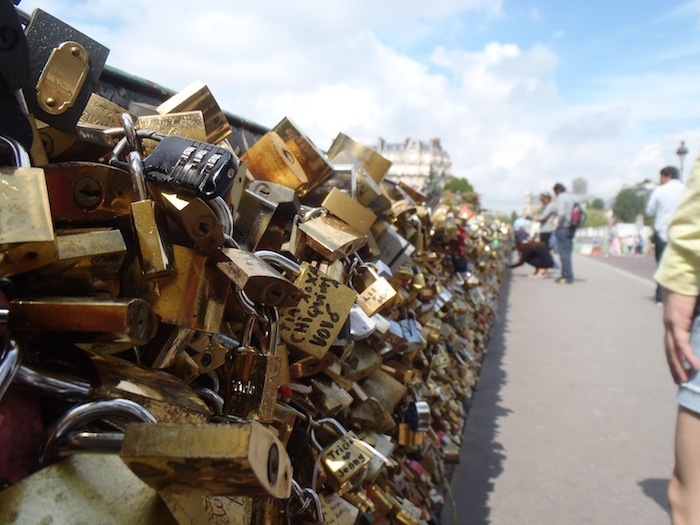 It was August, so there were very few French people in Paris. I kept saying, “All the pretty French girls are American!” The city was full of Americans, Brits, Italians, and Asians. The only people that spoke French were the frustrated waiters. 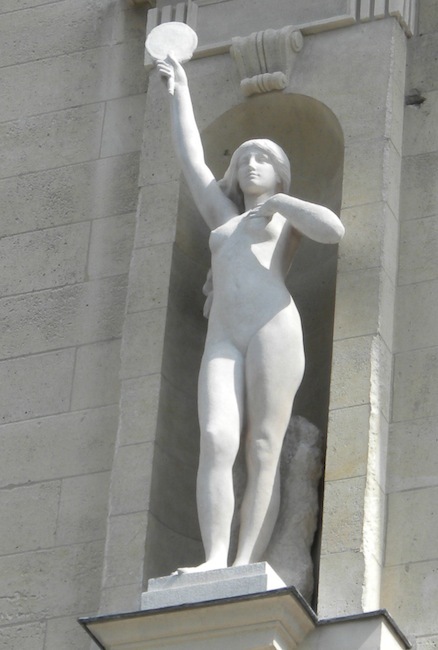 In La Louvre, the Mona Lisa was mobbed by Americans, and the statue of Cupid and Psyche was swooned over by Italian girls. Alas, Paris is still the Paris I recall from my highschool sophomore year. Our first morning there, we were crossing a bridge to Notre Dame where 2 “Romanians” apparently cased me for a mugging or more likely a pocket picking. I was out in front of my family, and these 2 guys approached from the other way. One specifically, stared me in the eyes as he walked at me. If I altered my step to the side, he matched me, and I knew he had a buddy. I knew he wanted bodily contact to rough me up while his buddy fished in my pockets. When we were almost nose-to-nose, I pulled a good ol’ fashioned spin move, which would make Bill Belichick proud. Looked over my shoulder, and the “Romanians” went on their way. The French see to like these funky fish. Of course Paris is not all bad. It is one of the loveliest cities in Europe. 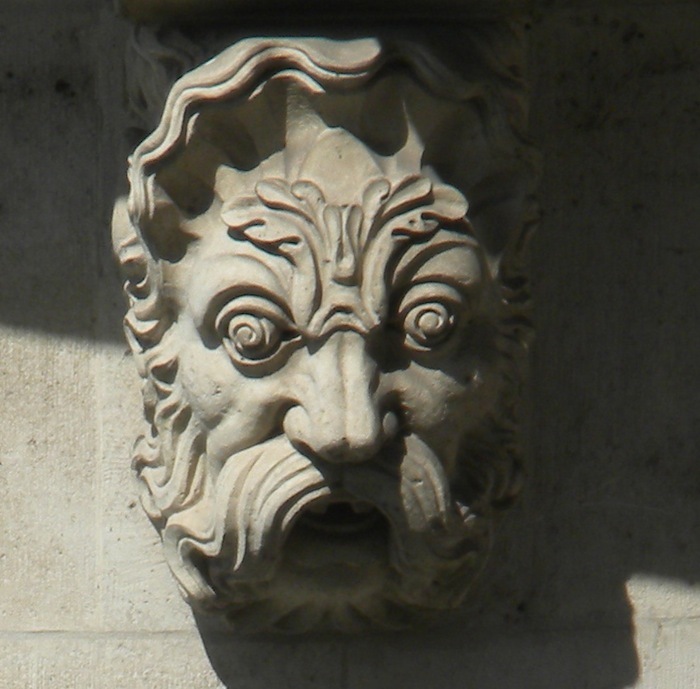 Cities in Europe ooze with art and sculpture out on the streets in a way that’s practically impossible in the States. 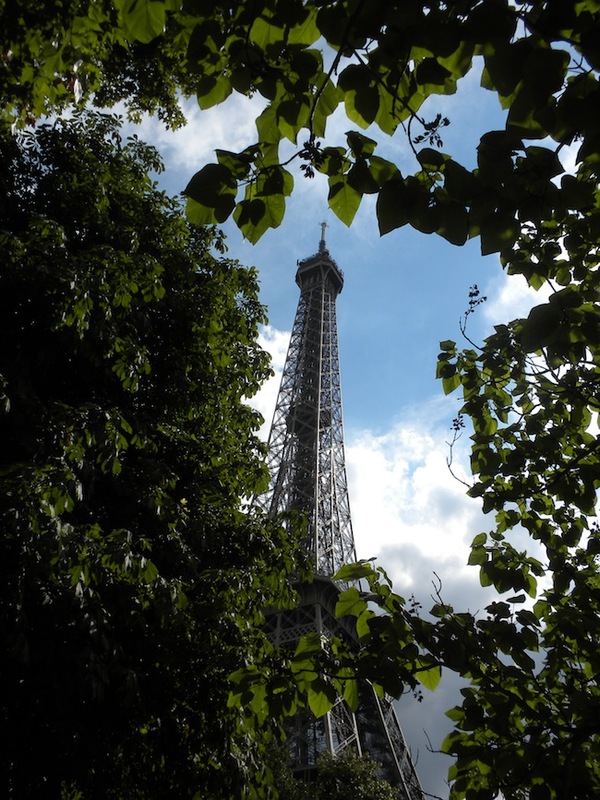 We walked from Notre Dame to the Eiffel Tower (and back). 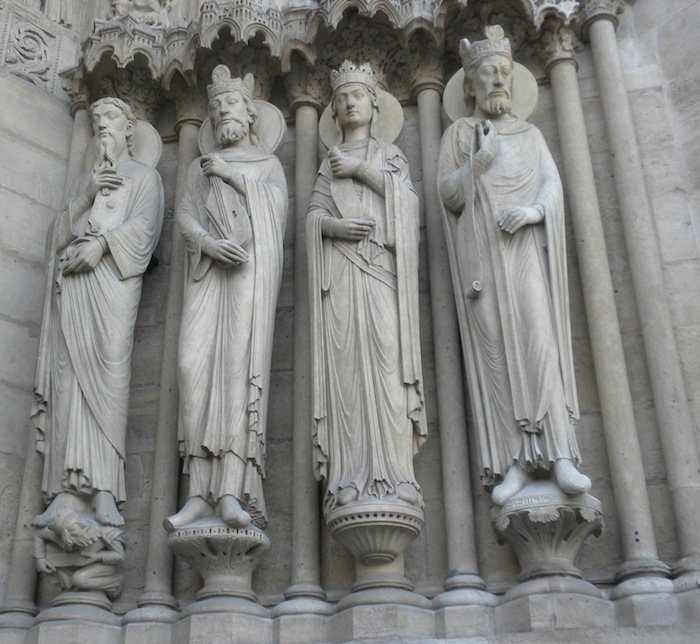 The blend of Gothic, neo-Classical, and Art Nouveau laid before us was literally 850 years in the making. Didn't make it to Montmartre. This is as close as we got. I will say that my meager French served me well. I made honest attempts to speak French at every encounter, yes with varied success. But on every encounter, the person I spoke to appreciated the attempt. 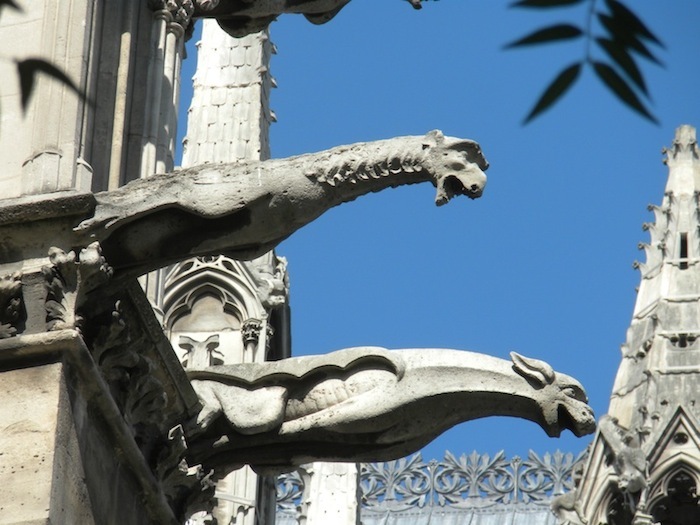 Often broken French was answered with broken English as we strived to get our concepts across. Why would anyone go up into a tower built by a guy named, "I Fell?" Paris in August is like Disney World. No, no, no, it’s not like Disney World; it’s turned into Disney World. 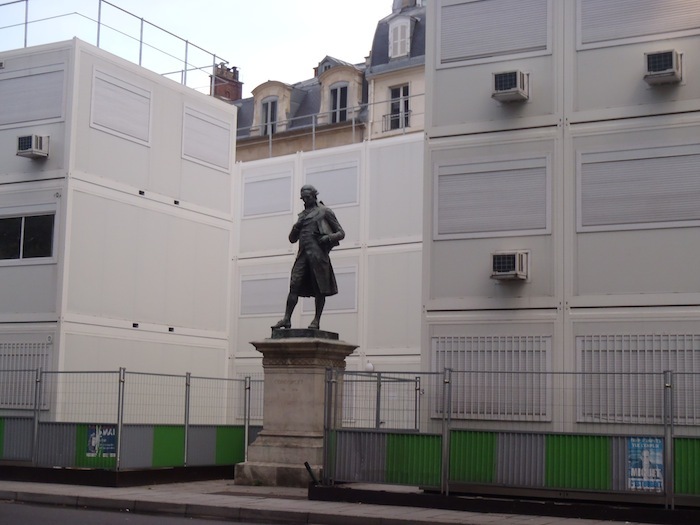 Yes, places like Paris are fill with the “Real Thing,” while Disney World is just a facade. The tourists turn the Paris into Disney World. The gift shop at Sainte Chappelle actually sells figurines of Disney characters, mostly from the Hunchback movie. But it’s the lines, the ques. People are willing to spend a morning or an afternoon to stand in a line. 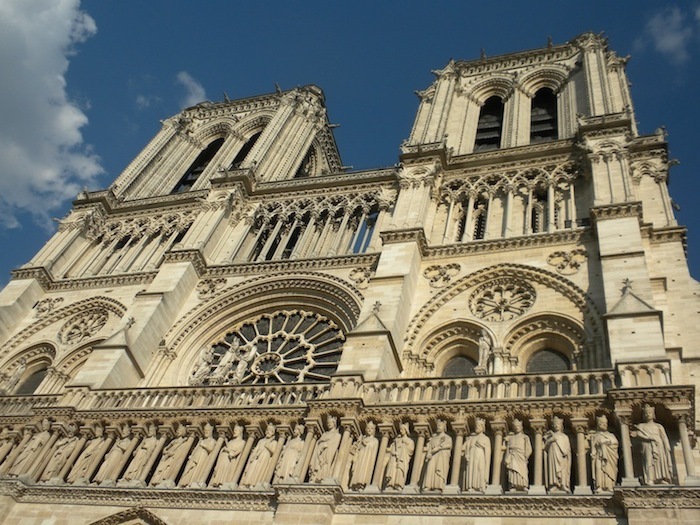 The line for the towers of Notre Dame stretched the length of the whole church. It was relatively short, but it was the slowest. 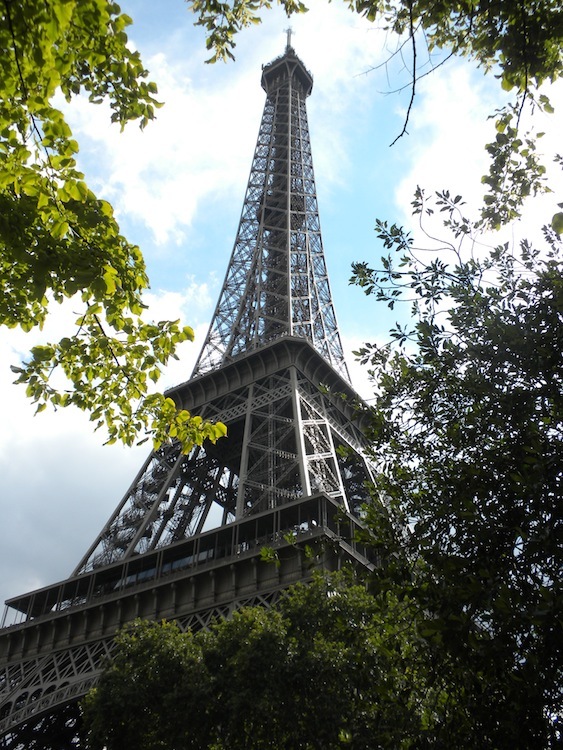 Max and I wanted to go up, but we only had the one day in Paris. We walked from Notre Dame to the Eiffel Tower (and back). The lines of people wanting to go up the Eiffel Tower swirled and spiraled their way from as far away as Portugal (I swear!). Those not waiting in line reclined on the grass mall along with the litter of paper, plastic bags and bottle caps. 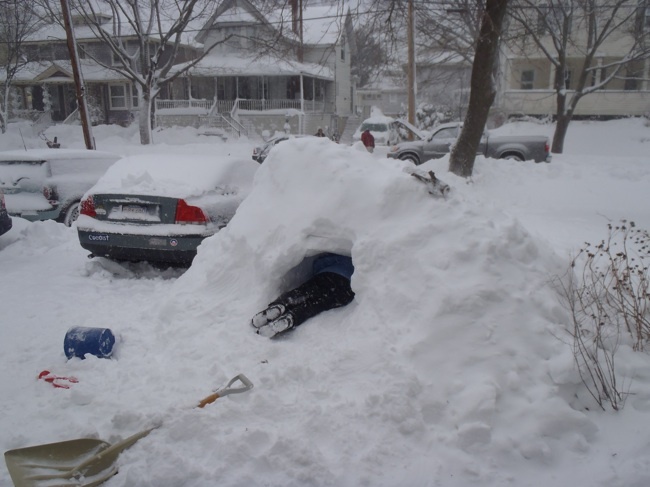 It needed to be dug out a little. It's cozy and warm inside. 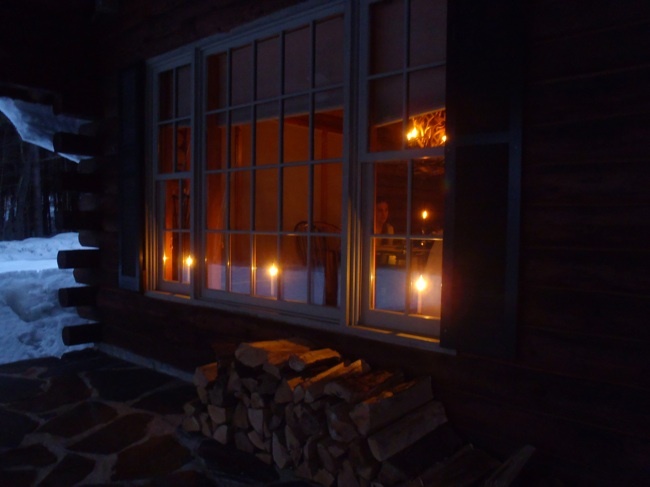 Christmas had already passed, but we turned the candles on anyway. Nice place to stay and do nothing. 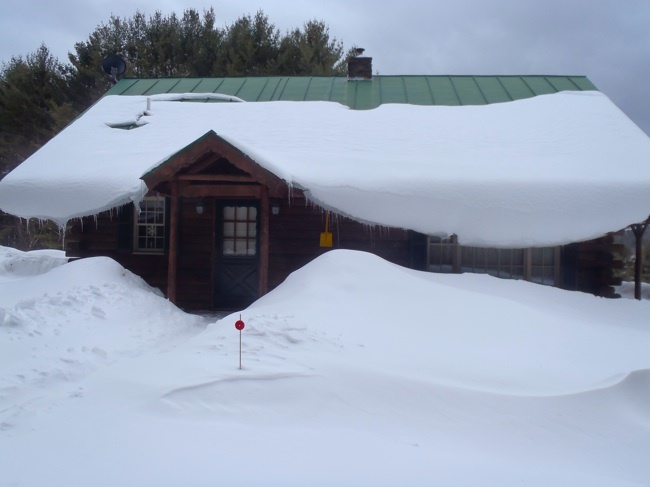 Ahh the house wrapped in 2 feet of snow. Working up an appetite. 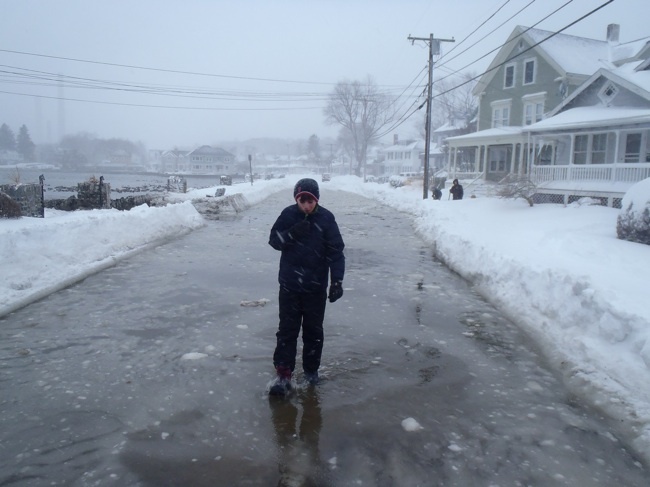 Max walked in as far as ankle deep, and then he thought better of continuing. 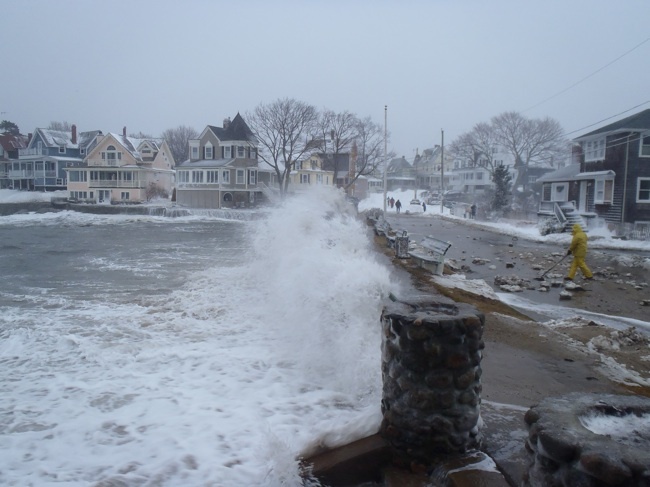 In storms like this, sometimes the road floods as the cove overflows from the tide and surge. 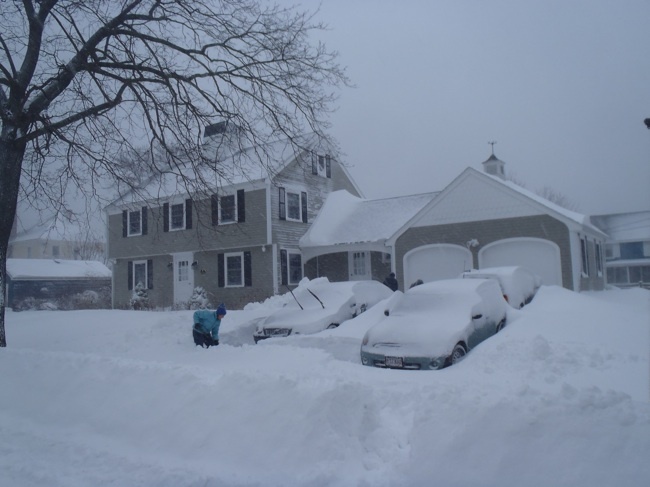 The two guys in the background are digging out their driveway. They can't dig out the mound at the end. It's a dam holding the sea water back. One of my favorite places in the world is right down the street from me. 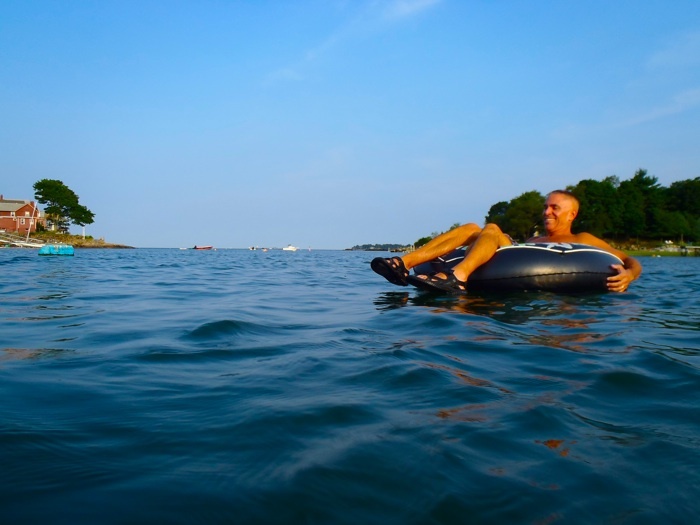 After a long hot Summer day at work, there’s not much better than taking a swim at Juniper Cove at high tide. 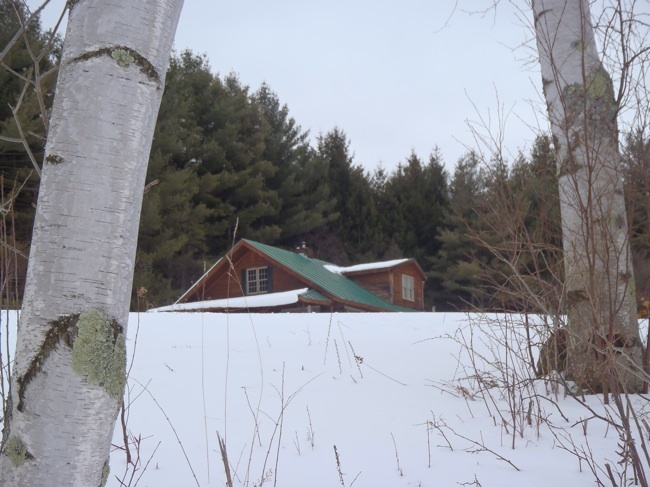 It can be quiet and peaceful, or it can be full of neighbors. It’s always refreshing. 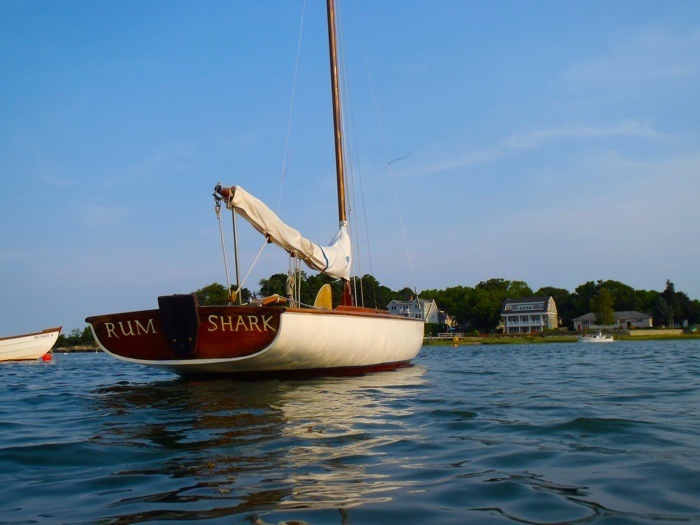 One of the gems in the cove is a boat, the Rum Shark, owned by a local. My goal was to swim out to it, and take pictures at a low angle, hopefully catching some low angle sunlight for a golden or reddish effect. By getting low, the rich blue of the water takes over the image. 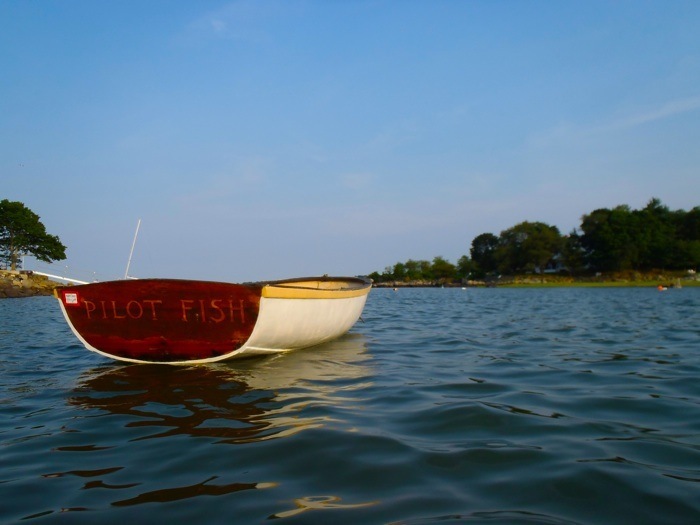 The Rum Shark has a tender called the Pilot Fish. I also tried to get a photo of the opening of Juniper Cove to get a view of the horizon and Marblehead. My neighbor, Bill, kept getting in the way. What did I do for the 4th of July? Why, I walked down to the end of my driveway; I had to get ready for 10 am. I’m usually there every 4th with my wife, kids, parents, and maybe a few guests. I serve mimosas with breakfast. 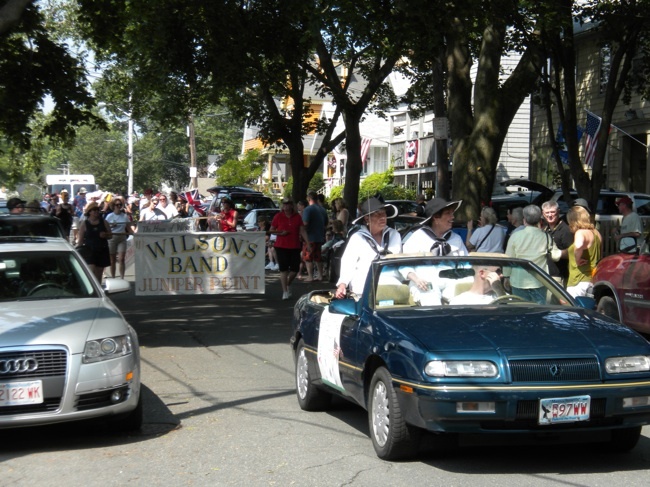 Here comes the Grand Marshalls at the front of the Parade, followed by the Wilson Family Band. Some of the entries are rather clever. 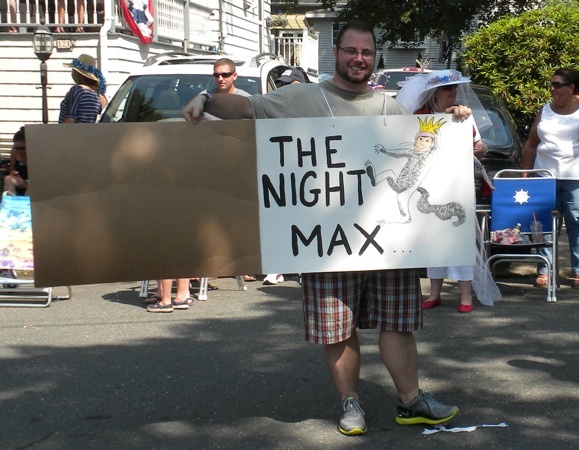 This guy did a series of over-sized children’s books. He’s done over-sized fish and go-carts in prior years. Click >HERE< to see his fish on a Flickr account. Many neighbors put together rather lavish floats. Some are planned weeks in advance, and constructed with meticulous care. Others are thought up at the last possible minute, and many, many bottles of beer contribute to the overnight (or early morning) construction. 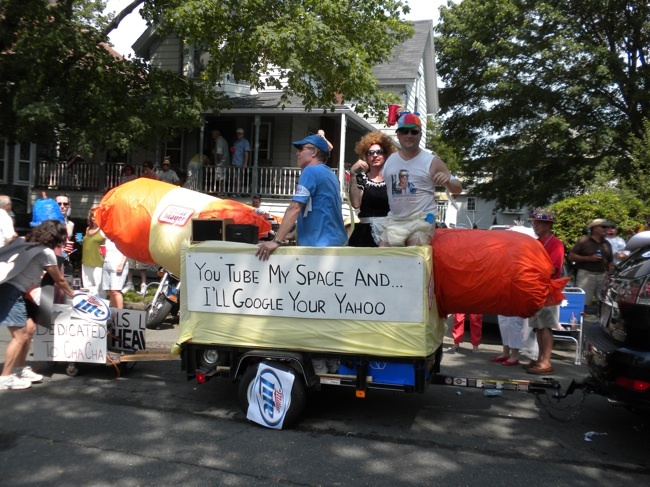 Floats often cover current events. This one celebrates the Boston Bruins winning the Stanley Cup Champion ship. 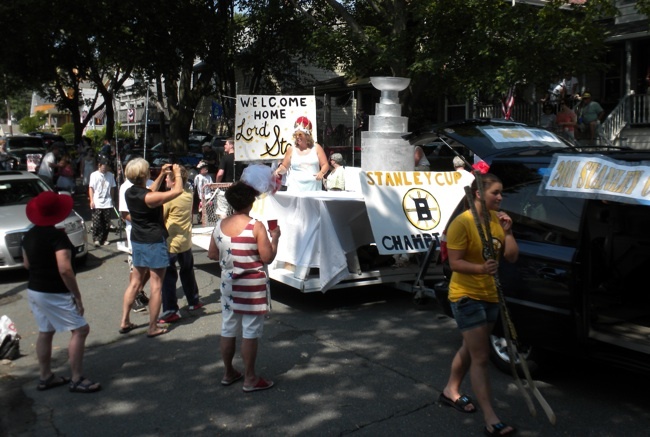 The Queen of the float offers kids a chance to toss a ball into the Cup. Those that make it, get to have their name written on the pedestal, of course. It is a “Horribles Parade,” after all. You never know what to expect. Stuff like making fun of politicians, tongue-in-cheek banners, and men in drag is to be expected. Rep. Anthony Weiner was too good to pass up for many. In fact, some can be rather over the top. 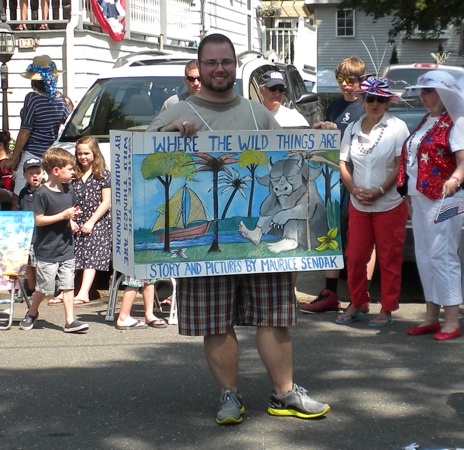 I am not going to discuss all of the floats in the parade. I don’t have quality photos. I don’t want the blog entry to be too long. And, as you can see by the sign, there are other reasons. You never know what you'll get. 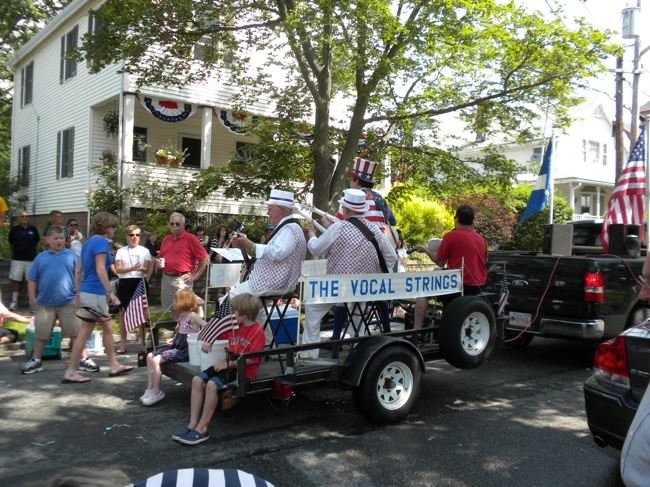 These guys have been in the parade almost every year, since I can remember. They went to high school with my parents. 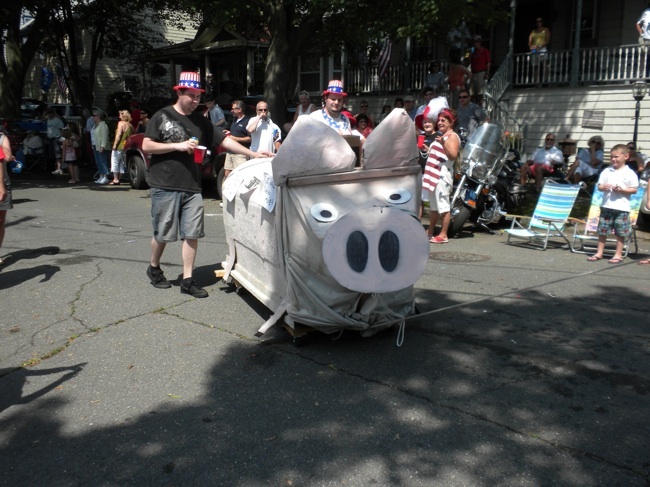 I like the pig on wheels. 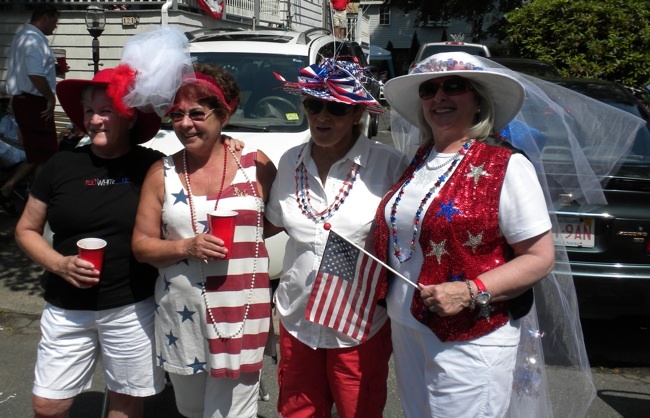 Finally, the ladies of the neighborhood did not want their sense of hat fashion to be outdone by Royal Wedding Invitees. 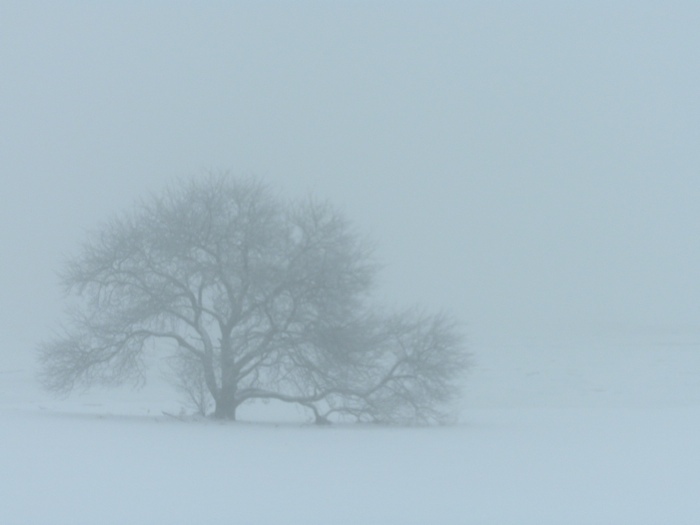 This tree is the symbol of the Essex County Greenbelt Association (http://www.ecga.org/). 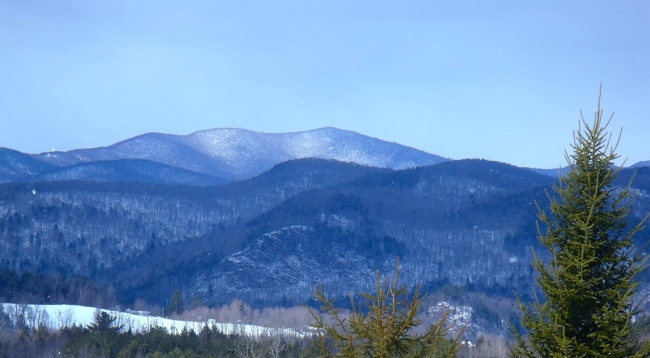 The ECGA is a land preservation non-profit, and these two shots were taken at their headquarters on the Cox Reservation in the Town of Essex, Massachusetts. 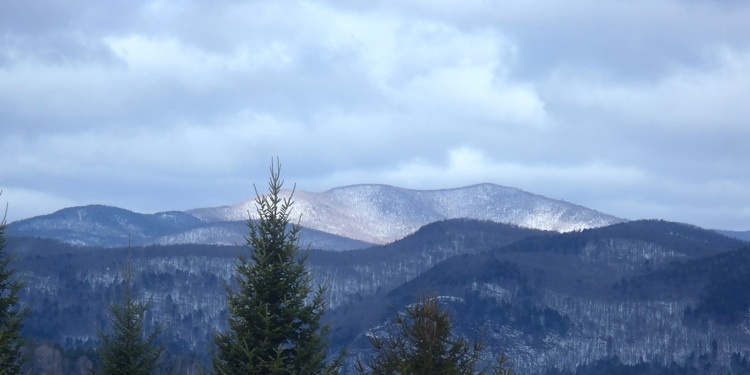 I hope I can get a picture in Spring, when the leaves come back. Here I am in my natural habitat. I guess it was mid to late Spring. 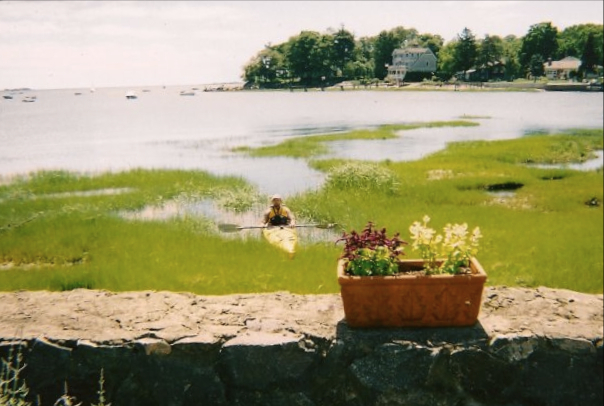 I took the kayak around the point and into Juniper Cove. Actually, it would’ve been a lot shorter walk. This spot is only a couple of blocks from home. So far, this is the only on my blog that I did not draw or photograph. 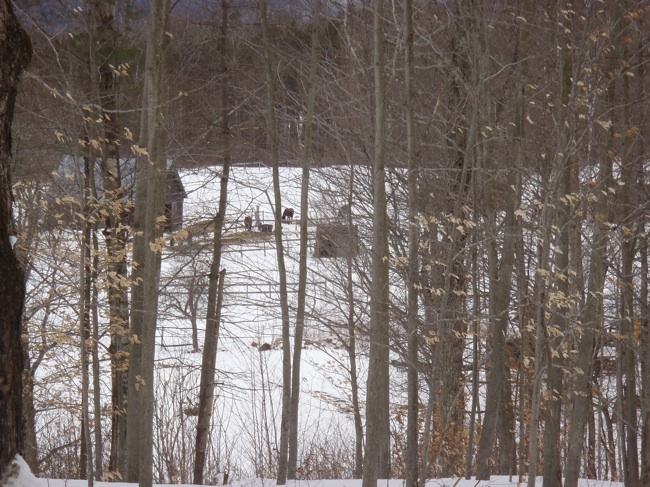 When I entered the cove, I could see one of my neighbors in his yard. I caught his attention to say, “hello.” He told me to wait while he got his camera. He quickly came back from his house with a disposable camera of all things. He wanted to use up some of the film, before he got it developed. He took this shot, and later gave me the proof. I know, I know. 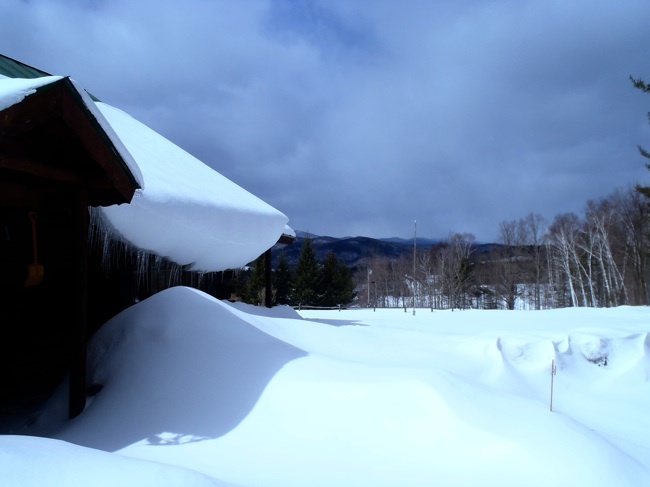 There’s snow in every US state, except Florida, and it’s cold there, too. Ha ha ha, even Hawaii has snow… on some of the mountain tops. 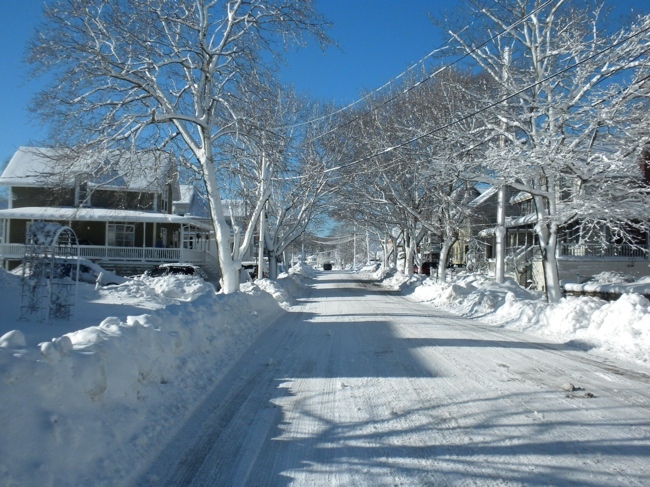 It’s been five days since the last storm, and the street still looks like this. 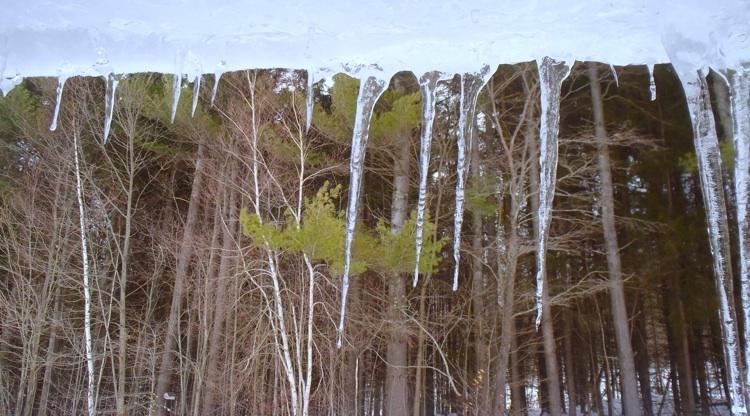 It just ain’t melting. 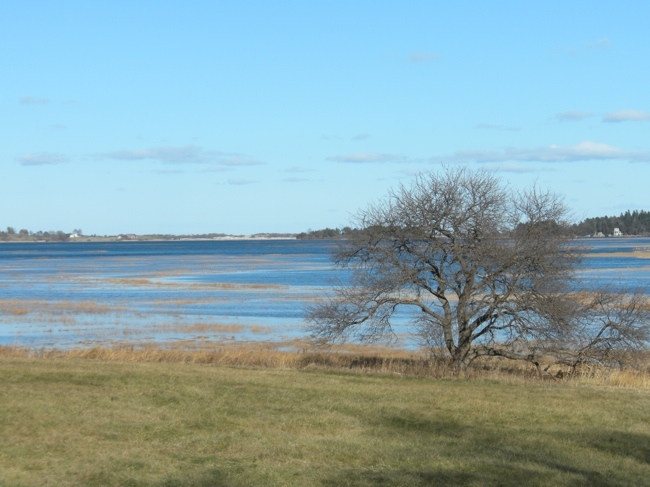 The wind came off of the water, and it blasted one side of each tree and house. 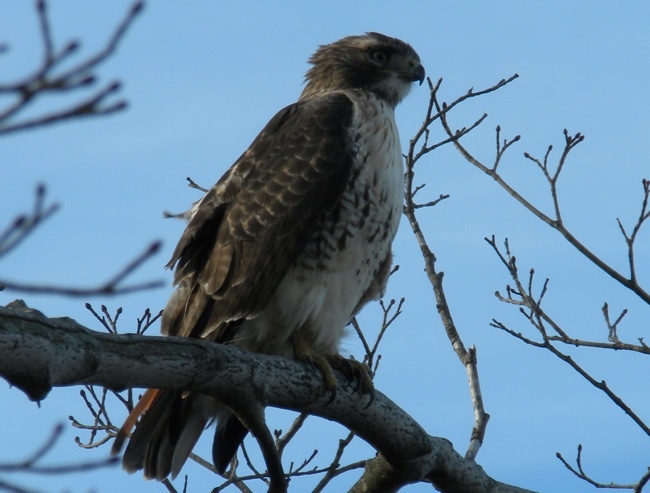 Saw this red-tail hawk perched in the Salem Willows. 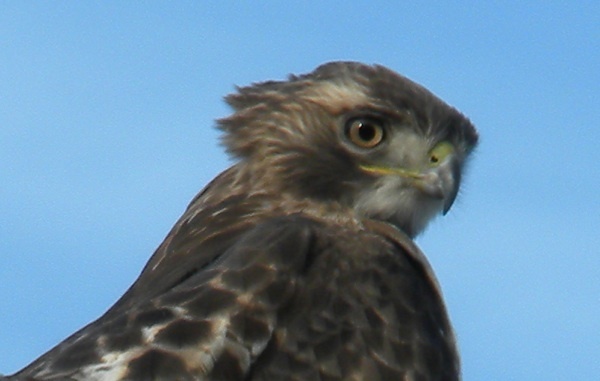 He was looking towards the pier. He was kind enough to strike the pose for me for these two shots. 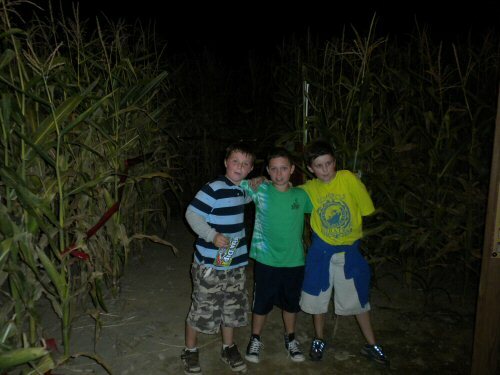 Our neighbors wanted to take Max to the Corn Maze at Marini Farms in Ipswich. 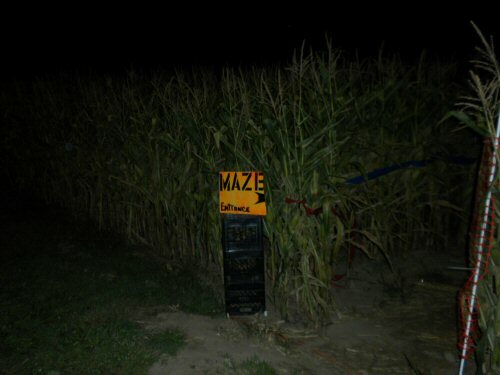 They’re open during the day, but Keenan, their son, wanted to try the maze at night. 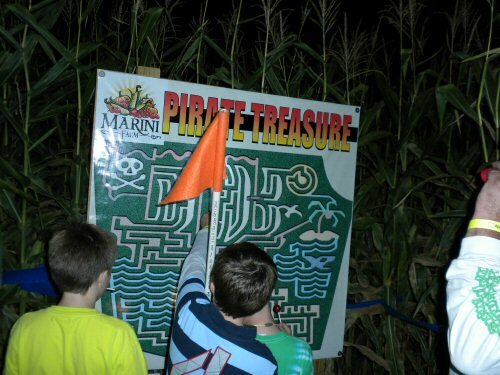 Marini Farms had flashlight nights on Friday and Saturday, so we could get lost in a corn maze … in the dark. If you ever go, there’s plenty to see and do. 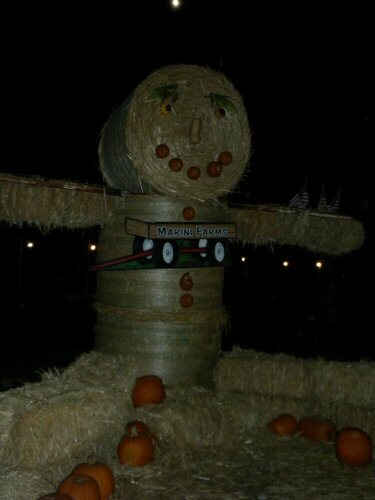 Apart from the maze, there’s pumpkin’s, a farm stand, and a bouncy field. They’ll also be starting apple shooters, which are kind of like potato shooters. Tickets for the maze at night were $10 per person, but they are less expensive during the day. Bring your own flashlights. There’s also a lesser children’s rate during the day. 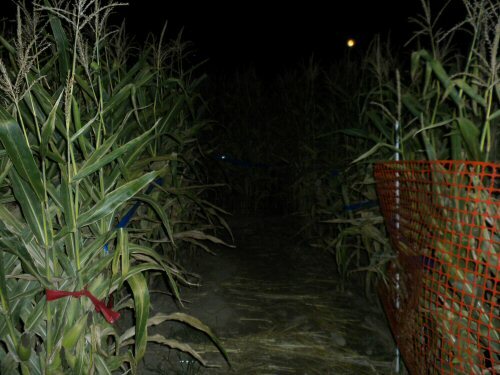 There certain rules for the maze: like no running and don’t pick the corn. After purchasing tickets, obtaining safety flags, and dealing out the flashlights, we headed over to the entrance … in the dark. For a time my neighbor, Benny, lead the way, but it was difficult to contain the excitement of the boys, Keenan, max, and Colby. 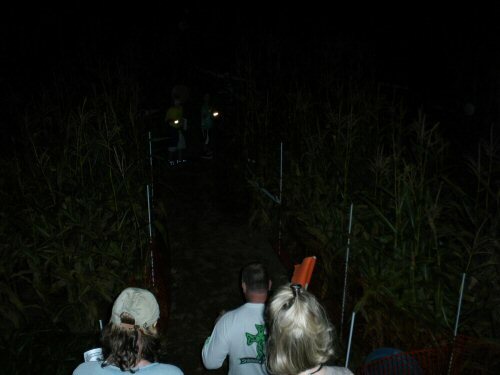 They had no fear whatsoever of diving into the maze … in the dark. Oh sure! There’s a map. The maze has two maps … in the dark. The maze covers over 8 acres. We did a lot of walking … in the dark. The paths are plowed out in the spring, when the corn is about knee high. A tractor driver is assisted by a GPS to plot out the paths through the corn. Are you sure it's this way? There were no minotaurs in the maze, which was a good thing. I kinda felt like Shoeless Joe Jackson from Field of Dreams, as I tromped my way through the stalks … in the dark. After the grown-ups started to get tired, it befell upon me to get us all out … in the dark. Using the map as a guide I used Theseus’ trick of keeping one hand on the “wall.” It didn’t always work, because I didn’t have an outside wall. I could find my way to certain objects in the maze. What?! There are tasks, too?! That’s right, there are objects in the maze, hidden … in the dark. There’s more to it than finding your way through … in the dark. 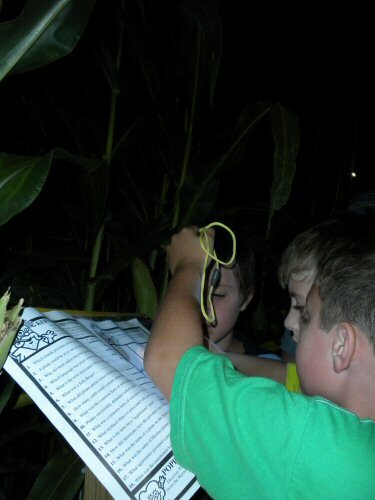 There are stations throughout the maze that assist you in completing tasks. There’s a scramble game. You look for stations in the maze that give you a word, and you right the word on a scramble sheet. If you find all the words, then you can guess the secret word at the end. There are also 9 pictographs hidden throughout the maze … in the dark. You find them, and take a rubbing as proof that you’ve been to that station. If you come across a station, and you recognize it, that means you’ve been there before. We didn’t complete the puzzles and pictograph stations. It takes about 2 hours to complete the maze, and we started around 9 pm. We started to get hungry there … in the dark. We found our way out, and luckily, we found a pizza place still open in Topsfield. Great time had by all.